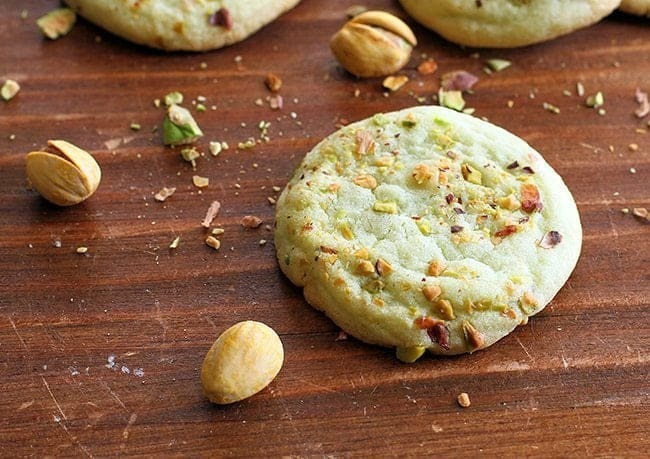 These Pistachio Pudding Cookies are my favourite cookie EVERRRRR. I am sure you all remember my confessed love of Pistachio Pudding from my Food Blogger Confessions, Foods I Should Not Love? I laid my food soul bare for you all, confessing my dirty little food love secrets. I love pistachio pudding from the box. Oh, do I love it. That and the Filet o’ Fish are my two biggest horrible-for-you food loves. Neither one has any redeeming nutritional qualities, but I don’t care. Yum yum, bring them on! I was craving it the other day – of course I was, I crave it at least once a month – and purchased two boxes of it. No, this recipe doesn’t need two boxes, I needed to have one in storage for backup, of course. I wanted to try making pudding cookies and of course, plain chocolate wasn’t good enough for this kid. I mean, come on, of all the puddings, I knew which one I was choosing! The pudding in the dough makes these really soft and chewy, little decadent bites of heaven. I took these for a special surprise for the kid’s afternoon snack and my daughter exulted that “these are the BEST things I have ever tasted!”. So either she is seriously deprived, or they really are that good. 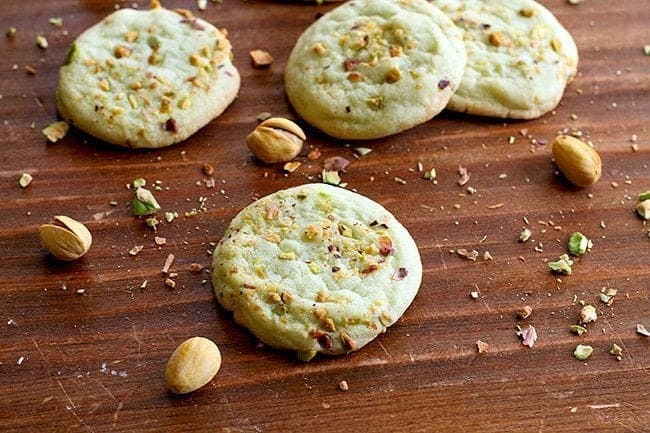 You know what else these pistachio pudding cookies are? Easy. Oh you still have to make real cookie dough, the pudding is simply a flavor you add to it, but they are still really simple. I really suggest that you roll the tops in pistachios as well, it just takes them over the edge looks and flavor wise! Try my pistachio cake made with pistachio pudding, it’s a popular recipe! My Pistachio buttercream frosting is also a treat! PIN THIS RECIPE to your COOKIES RECIPES Boards and Remember to FOLLOW ME ON PINTEREST! 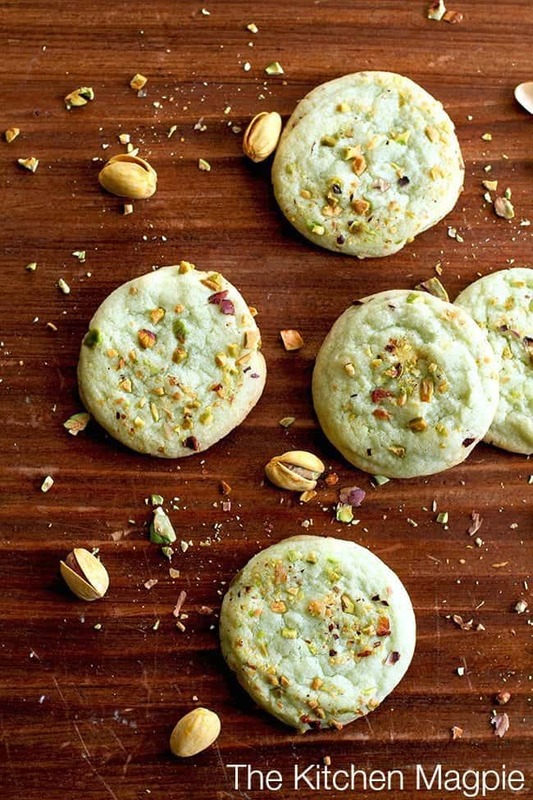 Chewy, rich pistachio pudding cookies, a new family favorite. Cream butter, sugar and Jello together. Combine flour & baking soda in a separate bowl then slowly add to butter mixture. Once it's all mixed completely, fold in chocolate chips. Using a TBSP cookie scoop, create the cookie ball, roll the top in the crushed pistachios, then place onto parchment lined baking sheet. Bake for 9-12 minutes, until the cookies bottoms are slightly browned. Let cool on cookie sheets for at least 5 minutes before removing to racks to cool completely. Then a half cherry on top, drizzling with white or chocolate. Hi I love pistachio too!! My hubby and I were walking through our Menards store one evening and right on a aisle they had flavorings all kinds of them and one was pistachio! It is wonderful! And have you made the pudding with heavy cream instead of milk?? OMG your going to die it is so good!! So fattening but oh so good. Can’t wait to try your recepie! Hey Karlynn! I’m just curious about the quantity of pudding mix. I bought the 99g box. Your recipe says “1 oz pkg. JELL-O Pistachio Instant Pudding 3.9 .”…so I converted 1 oz to roughly 28 grams, which I used, and the cookies just didn’t taste pistachio-ey enough. I wondered about the 3.9 oz at the end of the line item, and wondered if it was supposed to say “1 pkg. JELL-O Pistachio Instant Pudding 3.9 oz.”, but 99g converted to oz is 3.5 oz… ANYWAY, I’m re-attempting this recipe using the full 99 g packet, hopefully these turn out more to my liking. Looking forward to hearing back from you! Oh ugh it’s like the text shifted! It’s one 99 gram or 3.5 oz package. Do you need to prepare the pudding? Or just use the powder as is? I made these. The only change was to add cranberries instead but of pistachios. Best Christmas cookies ever. Period. Oh I have a homemade pudding cake in the cookbook! Using boxed mix! Look good! Something new I haven’t seen! The Kitchen Magpie Saw you on QVC. How exciting for you! Claire Mercer Merkley it was amazing!!!! So much fun! Worth it just to eat something THAT color. Something whimsical about them with that hint of green. Want to try. Hi, in step 2, do you mean the pudding mix (powder ) or actually make the pudding as per the package? I love them! I changed it a bit removed 1 cup white chocolate chips and added 1/2 cup dark chocolate chips and a 1/2 cup hole pistachios in its place. I could drizzle some white or even dark chocolate over these. The Pistachio Bunt cake with Pistachio Butter Cream Icing recipe on this idea is also pure evilness. It’s too bad they don’t have a Hazelnut pudding to follow on this same line. I’m the only one in my family who likes pistachio pudding, which means I wouldn’t have to share these!! Can I make these today for my birthday party tomorrow evening? Will they still be fine? @Domenick You bet, just make sure to keep them in a closed container! Hi! I was planning on making these for a party tomorrow – I, too, share a semi-shameful obsession with pistachio pudding mix – and I was wondering if the recipe calls for all-purpose or self-rising flour? @Amy all purpose! Good luck, I hope you love them as much as I do! These are a huge hit with all the guys I work with! Thank you for sharing. This recipe is a gem! @Natasha Fabulous! Thanks for letting me know! About to make these for Valentine’s Day. Do you flatten them or do they spread flat on their own? @Judy They will flatten out on their own!